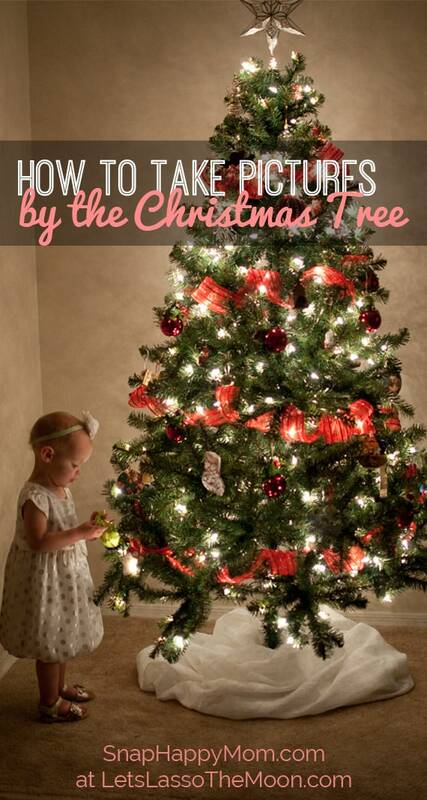 Christmas Tree Pictures: How To Take ADORABLE Photos With The Kids! The tree is trimmed and looking beautiful. Yet, every year I am beyond frustrated with how my Christmas tree pictures turn out. They are always flat and lack holiday warmth. Today Meg from Snap Happy Mom is going to share a few mom-to-mom tips with us on how to take beautiful photos by the Christmas tree! 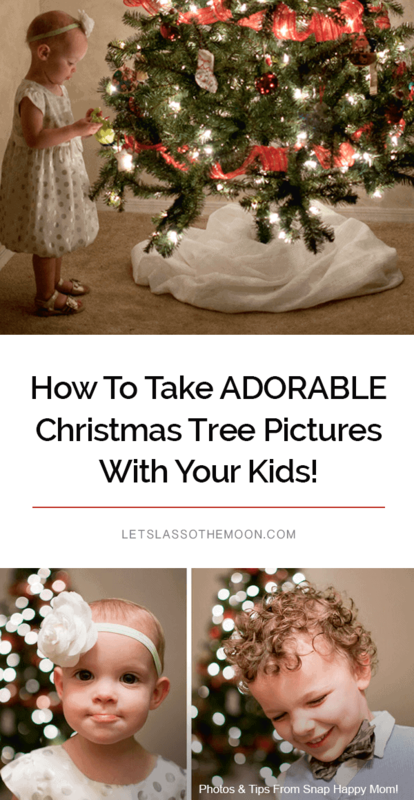 Once you have decorated your tree and dressed your kids up all cute, you probably want to take a picture of them next to the tree… and it’s harder than it looks! 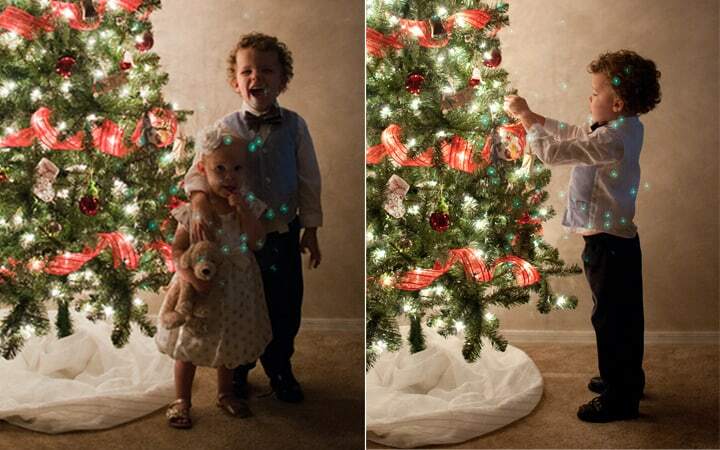 This is a tutorial for how to take a classic Christmas tree pictures of your kids next to the glowing holiday tree. 1. Get everything you need for your Christma tree pictures ready BEFORE you ask the kids to come over. For me, that meant I had to set up a tripod and push a couch out of the way. Then I set up my camera angle and started testing settings before I ever brought my kids into the equation. 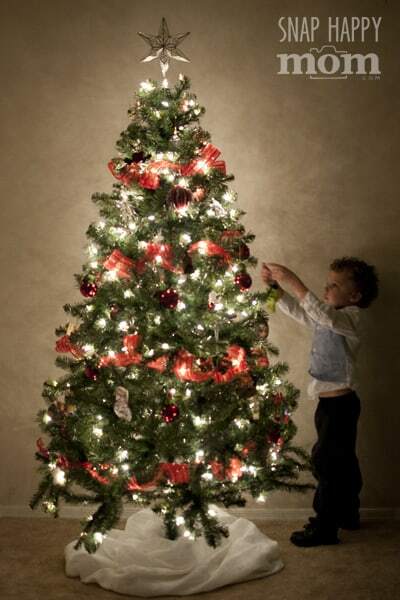 It may take a couple tries to get the right look for your Christmas tree picture, so don’t “waste” your kids happiest smiles and patience before you’re ready. 2. 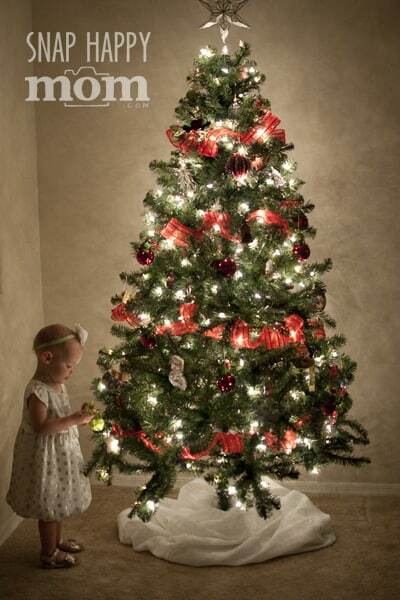 Consider what kind of Christmas tree picture style you want when you’re choosing your lights. I tried a few pictures with the lights on, and few with the lights off. This picture was taken with the light on in the room, and it’s definitely sharper than some of my others, but it lacks the festive atmosphere of the glowing Christmas tree. If you’re trying to show off that pretty holiday outfit to Grandma, you may want to turn on the light for a few. They are really cute, just not what I was looking for this time. 3. 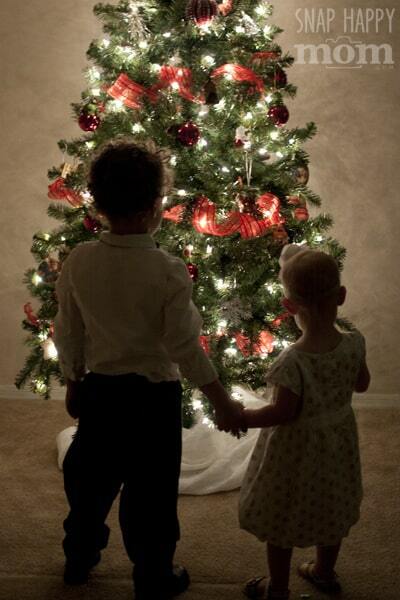 Your camera settings define the look of your Christmas tree photos of the kids. 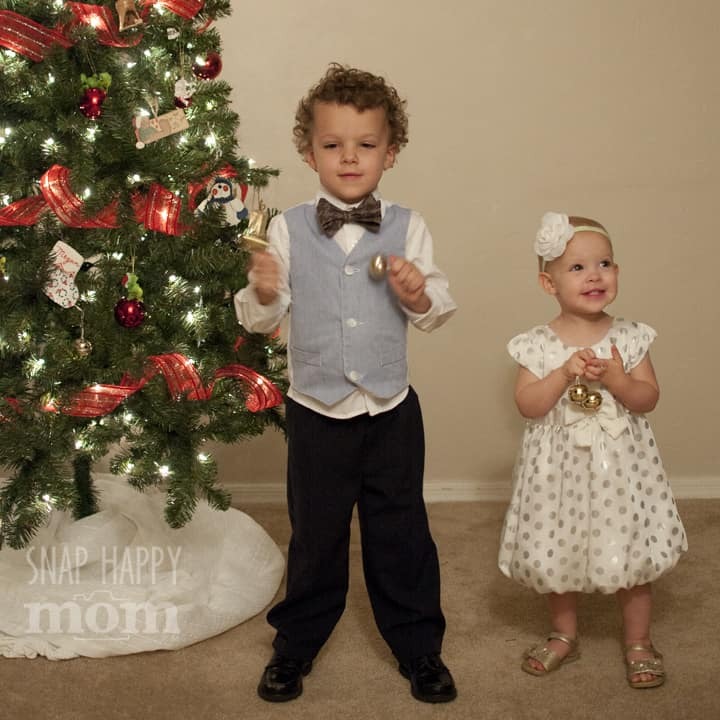 For this Christmas tree pictures, I wanted a classic photo with my kids next to the tree in a cute holiday outfit (for Grandma). There are lots of creative options you can do to create bokeh (to make those lights flare big and blurry) but this type of picture shows your kids enjoying the atmosphere of that glowing Christmas tree. 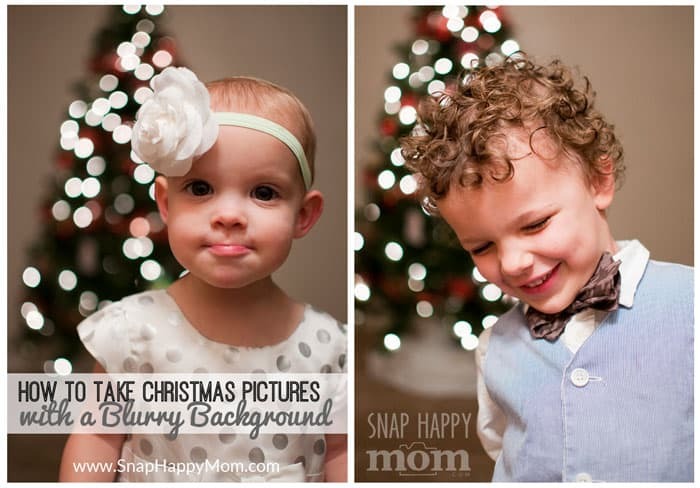 By the way, if you’re looking for a Christmas portrait with an artistic, blurry background, check out this tutorial! Feel free to experiment past these settings. I was hoping for a crisp picture, and this shutter speed is not quite fast enough to completely freeze motion, but I needed it that low to let in enough light. Many cameras have the ability to go higher with the ISO, but you may be unhappy with the amount of grain and noise at that level. You’ll have to decide that for yourself; I try to stay under 2000 for my camera. You want to place your subject very close to the tree to get their faces to light up. You’ll lose some of their expressions if they are not facing the tree, but that’s part of the moody atmosphere. You’ll get a cool silhouette effect if your subject is in front of the tree, but most of the time you’ll want to put your subject directly to the side of the tree. I recommend you start with my Christmas tree camera settings and go from there! If your pictures are too dark, open up your aperture first as wide as it will go. This means you are looking for the lowest number possible: if you only have the lens that came with your camera, this will probably be f/3.5. Then try raising your ISO a bit higher, and then start opening up your shutter. Also, consider that you can still have that moody light from the tree with just a touch more ambient lighting; an extra lamp in the room might give you just enough more light. I’ll be honest, I used to buy all my holiday cards through Shutterfly. Then I switched to minted a while back. I love the quality of the paper and the fact that they support independent artists, and their tree planting program. Have fun! Awesome, right? It’s a good indication of where their attitudes were by the end of these photos! 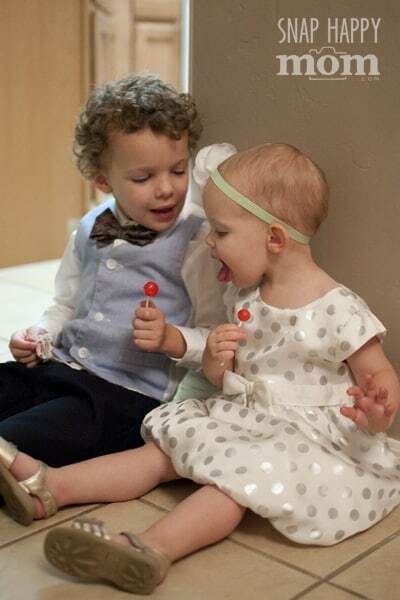 My kids are young, and they don’t particularly enjoy staged photo sessions. I think most kids dislike staged photos, no matter what age! So, it’s really important to be as ready as you can before you ask them to smile, and then to be realistic about the kind of Christmas tree pictures you’re going to get. Before you ask… No, I don’t have a perfect sweet smile from each of them, but I do have a real record of what life with a 3.5-year-old and 18-month-old is like. They don’t like to hold still, they are a bit grumpy near bedtime, and they are extremely independent. Those are the things I’ll remember from this year with these Christmas tree pictures, especially the outtakes! Don’t forget to celebrate when you’re done! Did I have to promise my kids a treat for some (pseudo) cooperation? You bet. And I definitely took the share-a-lick pictures too! I know Instagram is fun, but phone cameras simply cannot handle this low-light situation. Pull out your big girl camera, whether that is a compact camera or a DSLR, and you’ll be much happier with the results! You can always post your Christmas tree pictures on IG later. 5. Take the filter off your lens when shooting holiday photos! I always recommend that people keep a filter on their lens to protect it (read here about why you should use a filter) but this is one situation where you really want to take it off. Filters, ESPECIALLY cheap filters, can cause strange reflections and “ghosting” to appear in your pictures. Here are some examples of the pictures I took with a filter on… see the strange green dots floating around? That’s called ghosting, and it’s a reflection from the tree lights off my filter. If this wasn’t quite the Christmas picture you were hoping to take, check out this tutorial about using Christmas tree lights to create bokeh (see examples below). Wishing you a joyful holiday with your family! Meg writes at Snap Happy Mom, She is passionate about helping moms learn how to take better pictures of their families. Are you considering buying a new camera for the holidays? 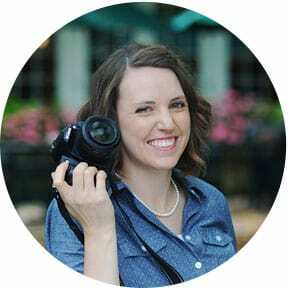 Check out her Point & Shoot Camera Guide, as well as her DSLR Camera Guide for tips about this year’s best cameras for parents. If you have a DLSR, Meg recommends a prime lens with a wide aperture for indoor photography: Nikon 35mm f/1.8 or the Canon 50 mm f/1.8. Feel free to email her with your photography questions! Wow, terrific post! Great information here. Now to break out my camera! I just got a camera yesterday, this is so helpful! Thank you! I like the ones with the filter on its like the fairy sprinkled them with her dust. What size lens allows you to take a fairly close shot but by capturing the whole environment? Nice pictures with the children. Much better than the “traditional” picture of the tree all by itself. Thanks for ones marvelous posting! I truly enjoyed reading it, you may be a great author.I will always bookmark your blog and will come back in the foreseeable future.